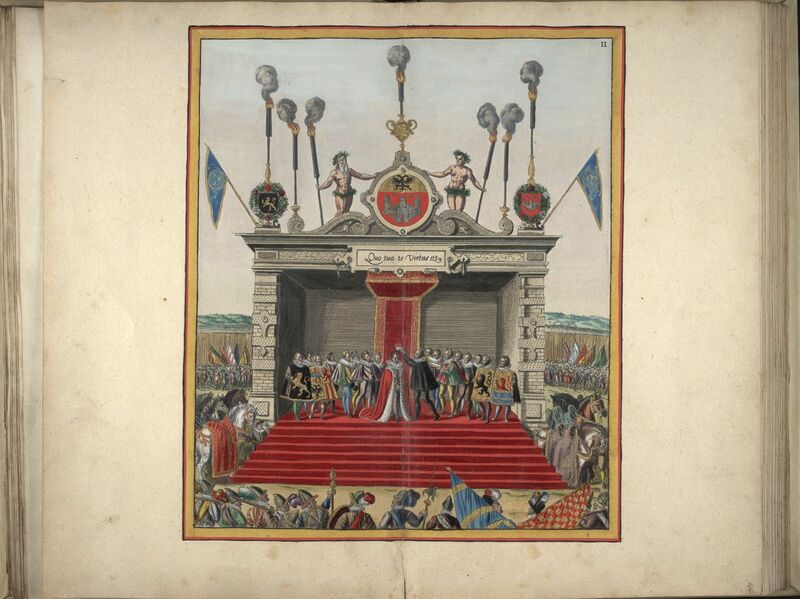 The thought of Richard III’s re-interment ceremony got me thinking about the royal festivals of the early modern era, when every coronation, wedding, procession, visitation or funeral was projected to peers and the public via the new medium of print. The festival books that record (or make up) these events are great examples of “official history”, or propaganda. If it was logistically impossible for the “new” monarchs of the sixteenth and seventeenth century to project absolute authority, they could at least project magnificence, even, as in the case of Richard’s vanquisher, Henry VII, and his granddaughter Elizabeth I, in death. 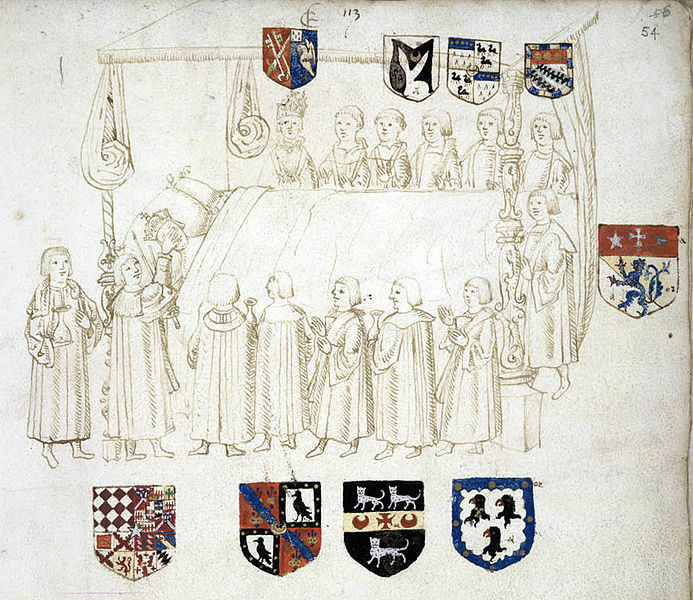 The Death of Henry VII in 1509 at Richmond Palace, British Library MS Additional 45131,f.54; Funeral procession of Elizabeth I, 1603, British Library MS. Add. 35 324, fol.37v. But these solemn displays were nothing compared to the elaborate events that occurred on the Continent, which were recorded in both lavish manuscript books and well as more spare printed texts. 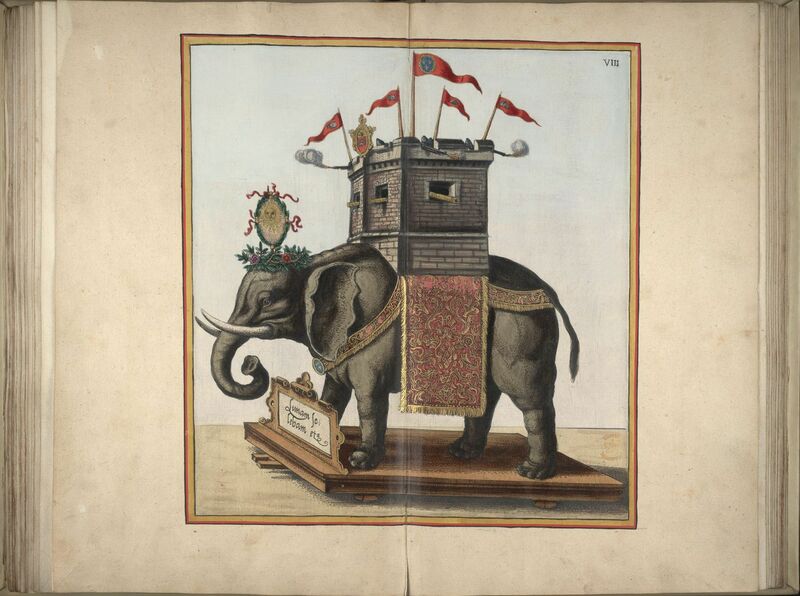 The British Library has digitized much of its collection of festival books, and assembled a comprehensive site where you can access over 250 texts in addition to links to other collections and scholarly context and analysis. In these texts, you can read about, and see, all sorts of amazing events staged to mark the “joyful entries” of Renaissance monarchs: processions (with detailed lists of participants), tournaments, masques and other theatrical performances, ballets, water spectacles, fireworks, and all sorts of temporary architectural and/or mechanical constructions. The effort and expensive that went into these festivities is all the more impressive (and of course, seemingly wasteful) because the moments are so fleeting. 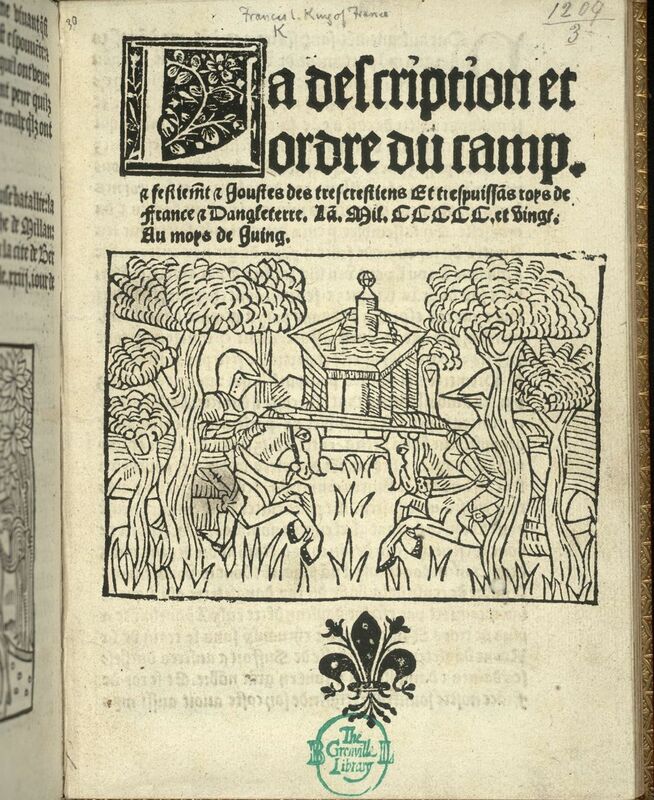 A great example of flagrant-display-for-very-little-purpose was the meeting of Kings Henry VIII of England and Francis I of France near Calais in June of 1520, which became known as the Field of Cloth of Gold because of the profligate use of gold for the pavilion tents and presentation clothing of the participants. The two kings achieved very little (besides a wrestling match in which Francis bested Henry), but they put on a great show. 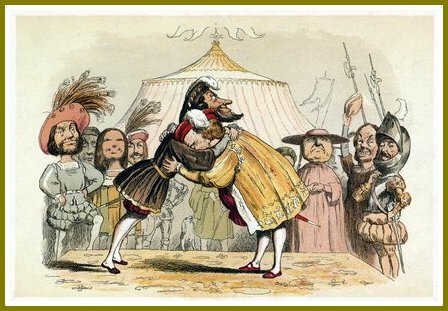 A printed account of the Field of Cloth of Gold, and two illustrations of the Pavilion tents, British Library MS Cotton Augustus III, folios 18-19; Punch caricaturist Richard Doyle’s cartoon of the wrestling match between Francis I and Henry VIII, Victoria & Albert Museum, London. 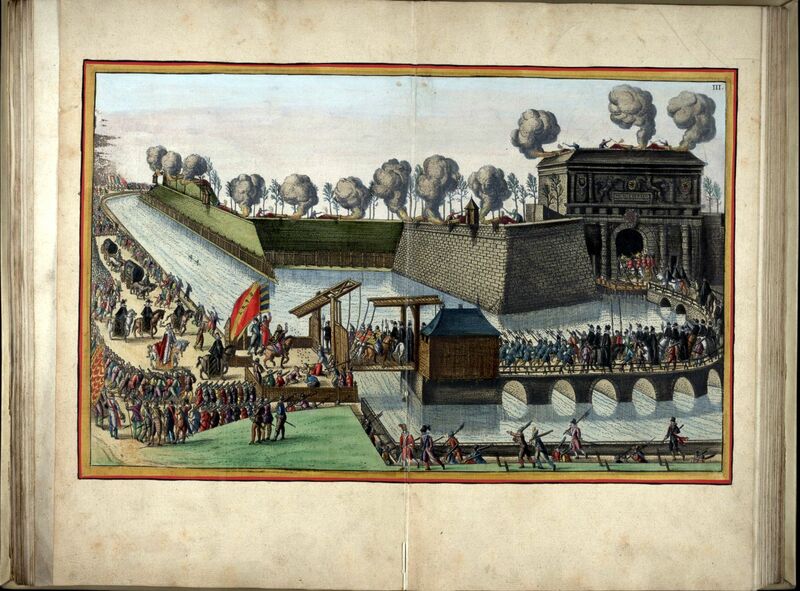 For both aesthetic and pedagogical reasons (and because it provokes shock and awe among my students), my favorite festival book is a beautifully illustrated account of the promenade into Antwerp of François,the Duke of Alencon and Anjou, in 1582. 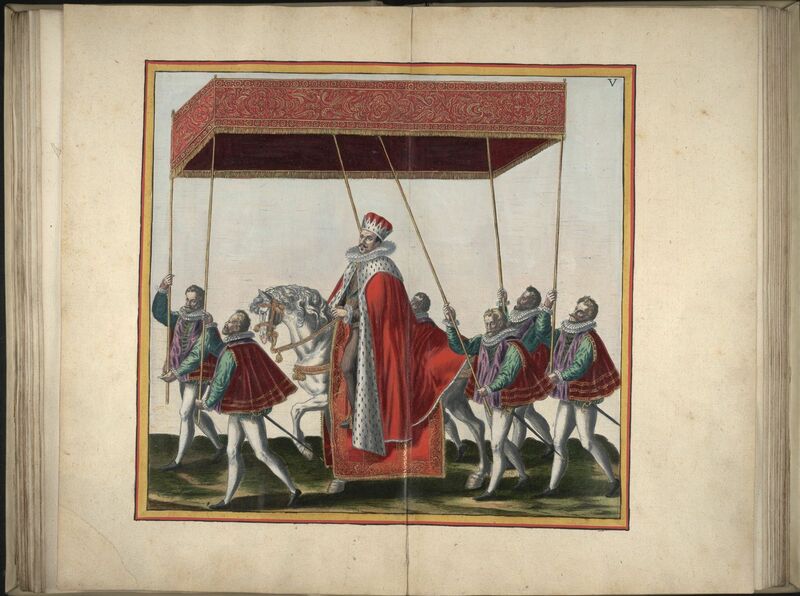 This elaborately-staged “joyous entry” was in fact an attempted conquest by the heir to the French throne (and Elizabeth’s serious suitor) in disguise, and the Duke barely escaped with his life. But what does that matter? There was an elephant in the parade! 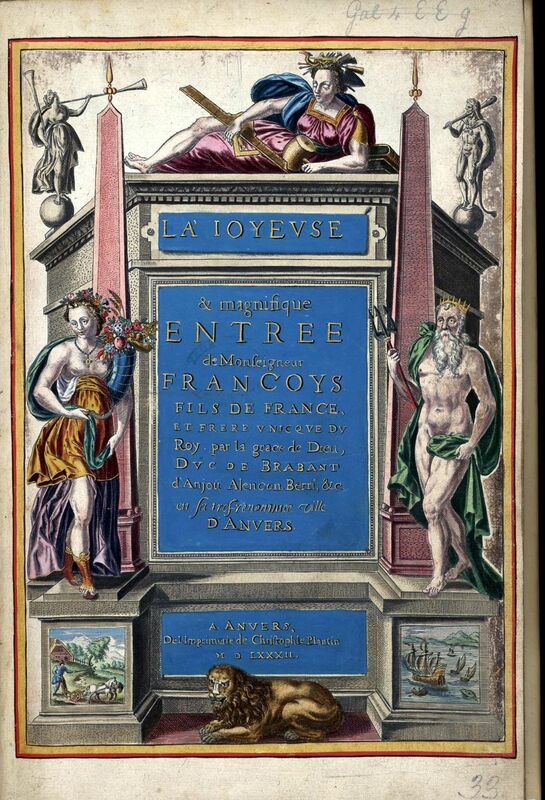 Title page and Scenes from La ioyeuse [et] magnifique entrée de monseigneur Francoys, fils de France, et frere unicque du roy, par la grace de dieu, duc de Brabant, d’Anjou, Alencon, Berri, [et]c. en sa tres-renomée ville d’Anvers (Antwerp, 1582), British Library.